In a feeble attempt to control my fragrance hobby, I signed up for the Scentbird subscription service, which sends subscribers a sprayer with about .27 oz. of a fragrance you select from among their offerings. You can pre-select several months’ worth at a time, and the monthly charge is $14.95. My first delivery arrived yesterday. It is Arquiste’s Flor y Canto, a fragrance that sounded as if I would like it very much, but which is VERY expensive, so a size less than a full bottle is warranted. “Flowery mist” is an apt description of Flor y Canto. It is purely floral with a slightly green, fresh note like fragrant leaves or the marigold flowers. This is a creative and effective use of marigold; its astringency cuts the sweetness of the white flowers and enhances them. It is much lighter and greener than the image at the top of this post, from the Arquiste website, suggests. Tenochtitlan and its sacred precinct were also the site of human sacrifices to the Aztec deities; one is thankful that Arquiste chose NOT to evoke those in the fragrance itself in spite of the reference to death and altars in their illustration. Flor y Canto is an elegant, soft, summery floral. It wafts gently from one’s wrists without overwhelming. Bravo, Arquiste and M. Flores-Roux! One of the tags I follow is “Perfume”. I have always loved perfume and even saved up my money in eighth grade to buy my mother a small flacon of Chanel No. 5, her signature perfume. An early memory of mine is sitting on her bed watching her get ready to go out with my father, as she sat at a real dressing-table whose lid, when lifted, revealed a mirror and a deep compartment filled with mysterious bottles of fragrance, lotion and makeup. I am firmly convinced that scent and fragrance can help transport us to a different (better?) state of mind, as the sense of smell connects to the most primitive, unconscious parts of the human brain, the ones that process emotions and memories. Let’s use that power for good! Serenity now! Today, another blog featured a subscription service called “Scentbird.” I loved that name so much, I had to read more just to find out what it was. Turns out it is a service where you pay a monthly fee to receive a decanted sample of a different named fragrance each month. This has clearly been given a lot of thought; subscribers get a special container to hold their samples, which come in small glass vials. Very creative! I had heard of another subscription for beauty supply samples — “Birchbox” — but not for fragrance. Where do they get these great names, by the way? Anyway, Scentbird also has a blog where contributors comment on various fragrances: Scentbird. 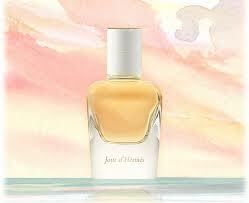 And today’s post included a fragrance I just tried myself in a store and liked very much: Hermes Jour d’Hermes. The blog aptly describes it as taking its wearer into a beautiful garden — and you know how much we love gardens here at Serenity Now. It was very appealing, with its white florals, green notes, sweet pea, citrus and water notes. And yes, it made me feel more serene. Next up for me to try: Hermes Jour d’Hermes Absolu, pictured above with my favorite roses!